William Ricketts (1898- 1993) lived in a generation where Aborigines were shunned, mistreated, and enslaved. 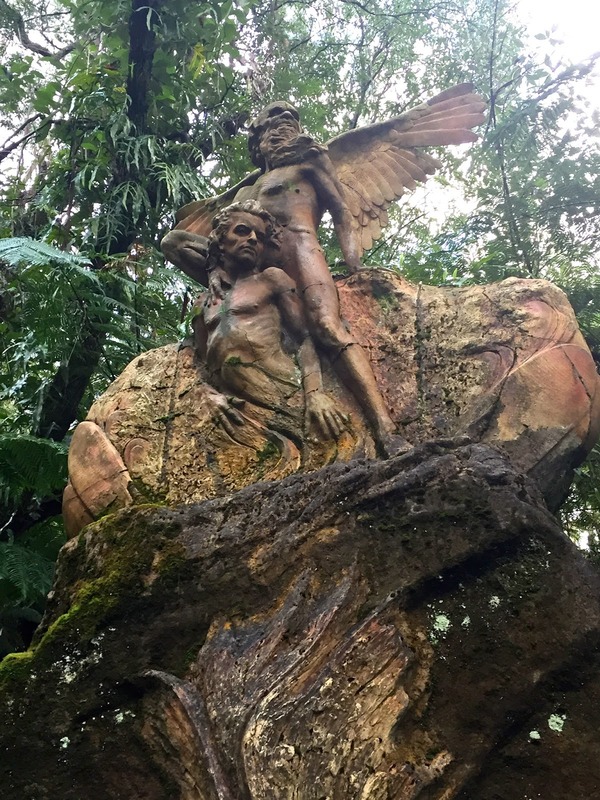 It was an era where the technologically advanced Europeans forcibly snatched and claimed the unexplored Down Under land of the Southern Hemisphere as their own under the horrifying gaze of the indigenous. Just around 60 years before Ricketts was born, the notorious John Batman’s group arrived and struck an unbelievably lopsided deal with the aborigines, acquiring over 600,000 acres of Melbourne land in exchange for a quantity of blankets, knives, scissors and other junks that the early settlors were more than happy to dispose of. The authorities in Sydney struck down the deal subsequently, not because of the apparent unfairness of the contractual terms, but because to the colonizers, the indigenous should be paid nothing. Australia was a terra nullius, an “unoccupied land”. The presence of the indigenous prior to the arrival of the white settlors was just an unfortunate inconvenience, a fact that could be easily disregarded and would soon be forgotten under the white supremacy policy. To the ruthless settlors, the indigenous was an ignorant bunch, an inferior population survived on primitive means of hunting and fishing without any concept of land ownership and basic rights. The white settlors came, cleared the land, depleted the natural resources, polluted the water, and hunted the indigenous. Between 1890s and 1970s, the colonizers implemented the shocking scheme of gradually wiping out the indigenous. The aboriginal children were being forcibly removed from their families. The new generations were subject to a series of sinister brainwashing plans; they were taught to reject their indigenous heritage, to forget their traditional languages, to adopt the white culture, all under the façade of a great ideology called “assimilation”. William Ricketts, an Anglo-Australian himself, must be a man possessed with unconventional ideals and powerful vision beyond his time. 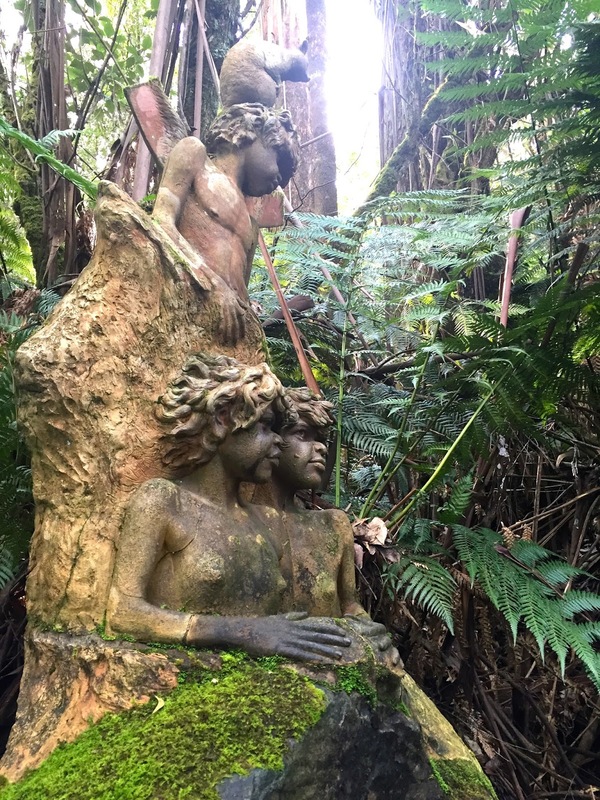 While the new settlors were engrossed in their ventures of changing the environment to adapt to the need of urban development, William Ricketts saw the rare beauty and harmonious relationship between the indigenous and the nature. He was captivated by the mysterious cultures, the complex spiritual life, and the simplicity of their livelihood. 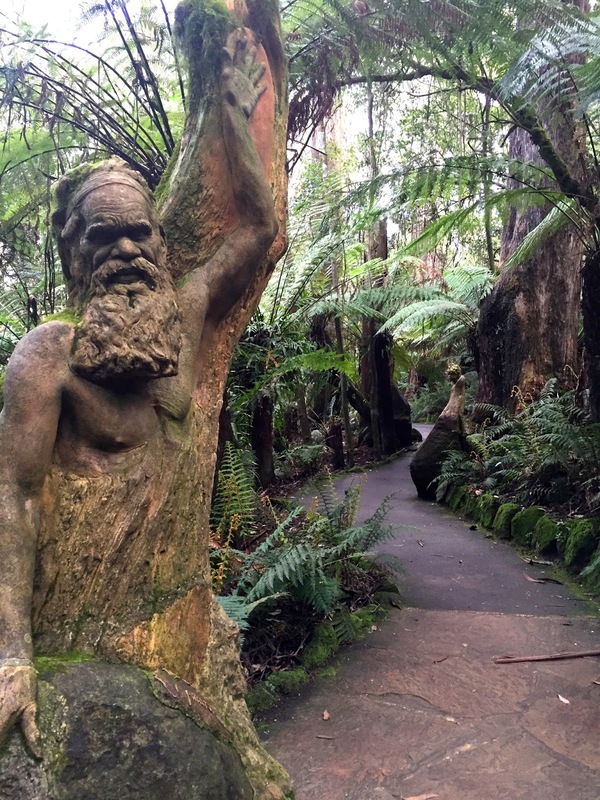 Ricketts spent the majority of his life in the tranquil Mount Dandenong, living amongst the lush eucalyptus and the secretive tree ferns. His lack of training in sculptural skills did not hinder his determination to produce extraordinarily beautiful sculptures depicting the harmonious and peaceful scenes between the indigenous and the natural world. Ricketts worked on the project from 1934 till his death in 1993, leaving us a surreal refuge within a verdant setting with his 92 mystical ceramic sculptures. Words can never describe the magical view meeting our eyes while we trod along the path meandering through the secretive park. 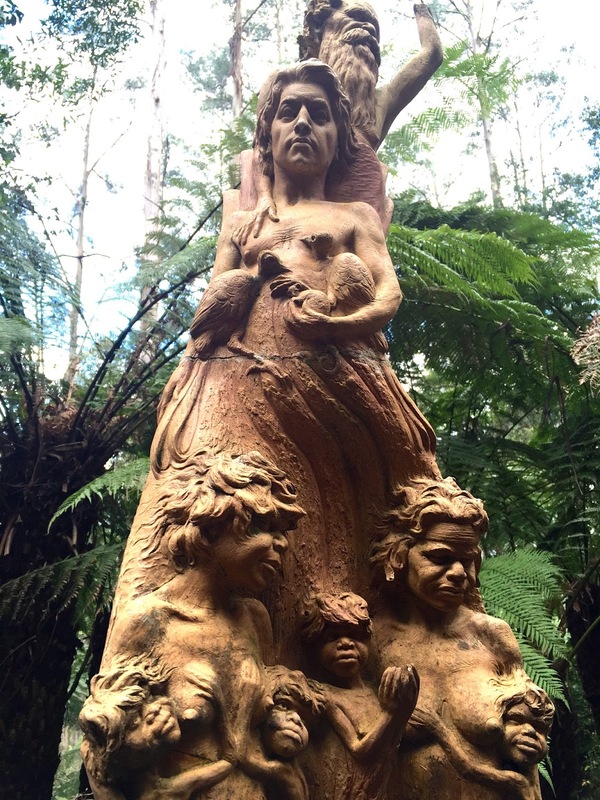 Those soulful eyes and the vivid expressions of the indigenous sculptures were testament to the strong bond between the aborigines and the nature, and a powerful reminder to us of the sacredness of the land.